For Dave Kindig successfully established himself in the genre of automobiles and became the most well-renowned personality in his field. And in an interview, he stated that his wife supported him to stay balanced for more than a silver jubilee. Dave is an automobile lover who spends most of his time with cars. He is an international television star who got immense fame from the hit television series Bitchin’ Rides. Kindig has led the automobile field with his unique skills and vision to craft truly one of a kind customs for nearly two decades. Dave, who celebrates his birthday on 6 February 1960, is a secretive person when it comes to his family life. He has not yet addressed any information about his parents to the media. He pursued his engineering degree in Hot Wheels and Legos. For Dave, cars were merely a hobby when he was young. He used to draw cars at the age of 5. Self-taught artist, Dave learned from watching others and fixing his own car. He started building things inside his garage, and everyone started noticing his work. His part-time hobby soon became his full-time work. 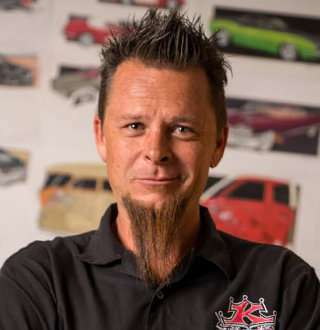 He got his breakout job after he was given the opportunity to draw a ‘69 Camaro which got featured in magazines like Super Chevy and Chevy High Performance. In June 1999, he started Kindig It Design and started drawing and designing cars. His business boomed, and he started getting invited to numerous television shows. After appearing in few shows, he teamed up with Fischer Productions in Park City for his hit series Bitchin’ Rides. The show was an immediate hit amongst car and automobile lovers worldwide. Currently airing its fifth season, the series can be viewed in the network The Velocity. With a successful career to himself, Dave undoubtedly enjoys a hefty amount of net worth and salary. As of present, precise information about his earnings has not been revealed yet. But, since he sells cars at six figures only, it would not be a surprise to anyone if his net worth is counted in millions. Likewise, Dave Kindig is a married man and has been for the past 26 years. He married his wife, Charity Kindig in the year 1992, and the pair have been inseparable since then. They also share two beautiful kids: daughter Baylee and son Drew. Dave prefers to spend time with his kids and shares those adorable moments on his social sites. He shared an Instagram picture of celebrating the Father's Day with his kids in June 2018. His daughter recently got married to a guy named Kaden in August 2018. Dave often credits his wife for his success and looks up to her when it comes to business matters as well. After the pair built Kindig- It Designs together, they have been unstoppable towards the path of success. The couple also run one of the best Hot Rod and Restoration shops. I've always been the 'go, go, go,' she's the 'whoa, whoa, whoa. I think that partnership with my wife and I has been one of the best things that have ever happened to me. There is no doubt that his wife has a significant influence on his life. With that, Charity even wished Dave on their 25th anniversary on 11 July 2017 via Twitter. Similarly, Dave wished on his wife on her birthday through his Instagram hoping for the best birthday on 2nd March 2018. Charity also shares the same passion as her husband when it comes to automobiles. She has attended car shows since her early age and her parents, Richard and Bonnie, were huge influences for her passion. She and her husband Dave now own and operate one of the countries best Hot Rod and Restoration shops. She turned her hours of car shows into another venture, named as Kindig-it Apparel, that offers a wide range of cutting-edge, culturally suitable clothing and handbags as well as different car parts. She is the co-owner of the company and is also the vice president, overseeing just about every part of the company. There is no doubt that Dave is living the best of his life. With a perfect family, a lavish house and a succesful profession, he surely has a permanent grin on his face. Bodily weight is the main problem for many peoples where some like to stay as it is while others thrive for a slim body. But, to lose weight requires a lot of determination and hard work. For Charity Kindig, her transformation from flab to fab was not without its difficulties. In a tweet, she posted, she thanked her husband for his constant support during her transition process and also did not fail to mention that everyone is strong enough to achieve what they want. ESPN star Josina Anderson's Anniversary Talks At Age 30's, Husband Or Boyfriend Of ESPN Insider? Drita D'Avanzo & Husband Now; Couple With Massive Net Worth Together?